There are few rivalries as storied and compelling as that between Spider-Man and his nemesis, the symbiote-powered Venom. So you might be curious as to why these two would be teaming up and how that would work out in a video game. Well we’re here to shed some light on that as well as tell you about an awesome co-op game that you need to check out if you love both retro and co-op. 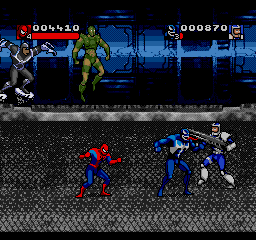 Venom/Spider-Man: Separation Anxiety came out in 1995 for Sega Mega Drive and the Super Nintendo. 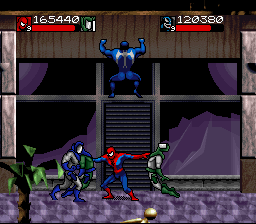 Developed by Software Creations and published by Akklaim, Venom/Spider-Man: Separation Anxiety is a beat ‘em up single-player or cooperative experience that, in the vein of the best beat ‘em ups of the 1990s, throws endless waves of enemies at you (and a friend) with no more complex an objective than absolutely clobber the heck out of all of them. 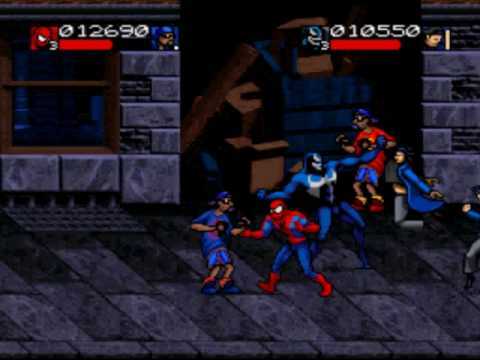 Possibly inspired by Konami’s amazing oeuvre of beat ‘em ups, starting with Teenage Mutant Ninja Turtles The Arcade Game and capping off with the X-Men Arcade Game, but Venom/Spider-Man: Separation Anxiety also takes cues from other popular titles in that genre like Streets of Rage or Final Fight. The action is slow by modern standards but intentionally so in order that the player not become overwhelmed and the game transforms into something frustrating and un-enjoyable. There’s a certain mindlessness to beat ‘em up games and Venom/Spider-Man: Separation Anxiety has mastered this completely. The addition of the bright, comic book-inspired graphics only highlights what a charming title it is but we warn you it really doesn’t do anything very different for its genre of which there are many examples. Not as popular today as they once were, beat ‘em up games like Venom/Spider-Man: Separation Anxiety take the spirit of the arcade and translate that to a home venue that makes the game almost incomplete without a crowd. Sure, Venom/Spider-Man: Separation Anxiety is a competent enough game on its own, but when played with a friend it becomes a much more engaging experience to say the least. That coupled with the fact that games that are designed for cooperative play tend to be better that way makes Venom/Spider-Man: Separation Anxiety a compelling offer even now. And we’re not talking multiplayer or any modern sense of “playing with others” in a video game – we’re talking a good, old fashioned arcade-style beat ‘em up that carries with it the soul of the 1990s in both form and execution. Spider-Man was a hot commodity at this time and still is but there weren’t nearly as many outlets for fans to get ahold of a “Spider-Man” simulation. This game isn’t that but if you enjoy the overall archetypes that Spider-Man and Venom present with their powers, plus endless hordes of people who need their face smashed in, then Venom/Spider-Man: Separation Anxiety is the perfect retro co-op title for you.